Pithale - Bhakri is very famous village dish in Maharashtra. You can make this pithale dry or as like curry but I curry version. It goes well with rice as well as roti. Pithale is one of my comfort food I can eat this pithale anytime. Usually we make Bajra or Jowar bhakri with pithale but right now I don't have those flour so making rice bhakri. In a bowl mix besan with sufficient amount of water to make a smooth paste just like uttappam batter. In a heavy bottom sauce pan heat oil. Then add mustard seeds. When mustard seeds stops popping add curry leaves. Fry for minute. Then add minced ginger, garlic, coconut & green chillies. Fry for a minute. Then add hing and onion. Cook onion till they become golden brown. Add turmeric powder. Mix it well. Then add one and half cup of hot water in the pan. Add salt, peanut powder and bring it to boil. Then add besan paste slowly into the pan. Stir this mixture often to avoid making lumps. Cook this mixture with lid for 5-7 minutes. Garnish this pithale with coriander. Serve this pithale with roti or bhakri or plain rice. 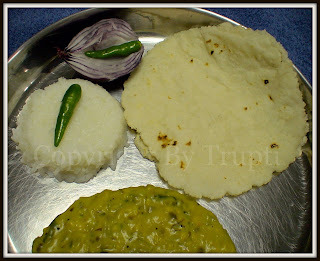 Don't forget to eat raw onion and if you wish green chillies with this pithale. Add salt into water and boil water in a small non stick sauce pan. Add rice flour slowly into the boiling water and keep stirring continuously to avoid making lumps. Cover the pan with lid and remove pan from gas. Keep this aside for 2-3 minutes. When rice dough is look warm knead it very well with hands. This dough should be just like roti dough. If need add some water. Divide the dough into small balls and cover these balls with wet cloth. Keep tava or griddle on the gas on low flame. On any flat surface spread some rice flour. Take one ball and roll it into thin bhakri with rolling pin or with hands. Roll bhakri on one side only. Place bhakri on hot tava and apply little water every where on the top of the bhakri. Make sure that rice flour side of bhakri is on the top. Once water gets evaporated turn it over and cook for at least 10 seconds. Then remove tava from gas and by using steel spatula cook bhakri on the gas burner from both sides. Serve this hot bhakri with pithale or garlic chutney or thecha or any curry. Note: For bajra or jowar bhakri avoid first 3 steps. Just add look warm water in a flour and make a dough. Rest of procedure is same. This Pithale - Bhakri goes to Shama's Village Special Recipes and Pithale goes to my Comfort Food for Illness event. Now it's award time. Saritha of My Kitchen's Aroma, Pooja of Sai Kitchen, Hema of Salt to Taste, Dhanya of My Home Cooking , Suparna of Food Fascination and Priya of Priya's Sourashtrian Kitchen gave me 'I love your blog' award. Thank you very much Saritha, Pooja, Hema, Suparna, Dhanya and Priya. I am honored to get this award. 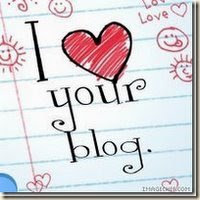 Nominate at least 7 other blogs (Only if you like).